Together, they can face anything. But the most dangerous foe has been there all along, and when the truths are exposed and the lies come crumbling down, which side will Daemon and Katy be standing on? And will they even be together? Bethany's rescue and Blake's betrayal have left Katy at the mercy of Daedalus. Trapped and utterly alone, she's been transported to a secure government facility in Navada, where she is expected to cooperate, branding her a risk to national security. Katy is a hybrid, a result of being healed by an alien life form, simply known as the Luxen, and now has unimaginable power, strength and speed. Daedalus are taking precautions to ensure hybrids are controlled, tainted and tortured. Katy's only hope is that boyfriend, and Luxen Daemon, steers clear of the facility. It's been thirty one hours and forty one minutes since Kat was captured, and Daemon has been counting every moment. His friends and family have detained him in a secure location within the Luxen community, knowing he wants nothing more than to find his Kitten. He refuses to sit idly by while Kat is likely being tortured. Seeing how the facility has drained Beth of life, he needs to free Kat... And fast. He no longer has the support of the Luxen community, their disgust at his willingness to risk his race, for that of a human girl. He'll burn the world down to save her. Daedalus are claiming that the Luxen have it wrong. They are humanitarians, developing a potent serum designed to illness and terminal diseases within the human race, and the hybrid and Luxan genes are invaluable in the process. Katy is put through a series of exams to test her stability, but nothing could have prepared her for facing off against other hybrids, a potential fight to the death. Kat refuses to fight back, she won't allow Daedalus to steal her humanity, especially with thoughts of Bethany and Dawson fresh in her mind. But when Blake is brought in to push Katy to her limits... She may not be able to hold back any longer. Daemon wants to be captured, figuring it's the only way he can be taken to Kat. A visit to club owner Luc finds Daemon with an unlikely mutual benefit, Luc wants the potent serum being tested at Daedalus, in exchange for aiding in Kat's release. Luc has an inside contact, and Daemon has no choice other than to trust him and after Blake's betrayal, that is no easy feat. There are forty five thousand Luxen here on Earth, the Daedalus estimate that nine thousand of those want human kind enslaved, and need to be dealt with. The government facility are building an army, one the world has never seen before, and hybrids and submissive Luxen alike are an integral part of the fight. The statistics are astounding, will Kat entertain the idea that the world is in jeopardy, believing those that are keeping her captive? When Daemon arrives, the two know they need to fight for their survival and escape the claws of their captors. When they discover a group of unrestrained and deadly Origins, it seems the Daedalus truly are on the brink of preparing for war. But they never expected one of their own to be working against them, and not all of them will survive. The Vegas Strip will alight the world. 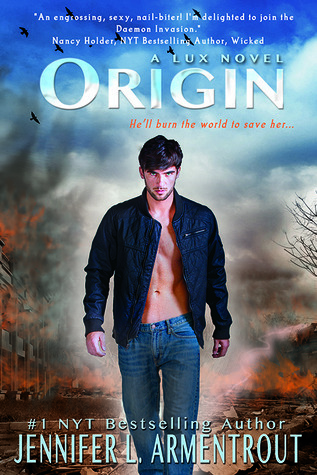 Origin was explosive, from beginning to end. Told in dual points of view, from the detained Kat, to Daemon, who is looking to free her. The government has devised a plan to create a perfect race, free of illness and disease, called Origins. They are being harnessed as a supernatural army, to wipe out those who want to see the humans enslaved. The Lux series is brilliant, and Origin is no different. Loveable characters, and Jennifer L Armentrout has created a world where readers will no doubt find themselves lost between the pages and fully immersed. The cheeky reference to the character's from Sweet Evil by Wendy Higgins was very cute indeed. I just finished this book about an hour ago. SO GOOD!! Ohhh, Wasn't it! I loved the last few chapters, even with the death and destruction. Archer was an awesome addition. Glad you loved it as much as I did, I'm sure fans of the Lux series will too.